Best selling author Leta Nolan Childers unites time, space and human foibles in three heart-warming and humorous stories of the holiday season. In "Basket of Bliss," an Irish fisherman comes home to a big surprise--and the change of a lifetime. In "Ring the Cyber-bells," Mary Christmas learns true giving begins at home, even if you live on the Internet. And, in "A Hope for Happiness," a bumbling thief finds his own heart stolen. 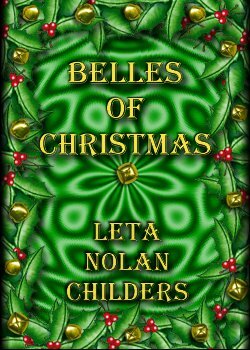 The Yuletide season is celebrated in "Belles of Christmas." I got this book as a gift from Leta Childers for Christmas 2000. She was my secret Santa! I read it right away because it was Christmas time. I enjoyed the three stories. Two months later, I was feeling a little blue and looked through my files and there it was. I opened it up and the stories took me back to that feeling again. It was a good, satisfying way to feel.